Figure. Ice Concentration distribution in 1950 compared with that estimated for 2010. 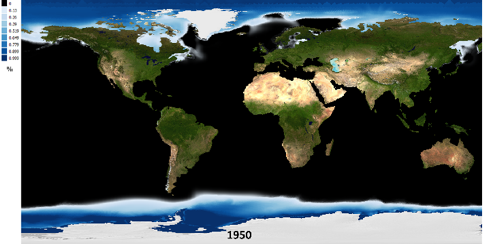 BlueBRIDGE released 61 maps as NetCDF representations for the years 1950, 1999, 2016, 2050 and 2100 with .5° resolution at global scale. NetCDF is an interoperability-friendly and compact format that can easily be visualised (e.g. QGIS, Unidata ToolsUI, etc). The maps for Sea Surface Temperature, Sea Bottom Temperature, Sea Surface Salinity, Salinity at Sea Bottom, Ice Concentration, and Primary Production were projected in the future based on the IPCC SRES A2 scenario of rapid economic and global population growth. For annual Average Surface Air Temperature and Precipitations forecasts, 20 general circulation models of NASA were merged for two scenarios; medium mitigation of greenhouse gasses concentration (RCP 4.5), and high greenhouse gasses concentration (RCP 8.5). The data have already been presented to the “Expert meeting on climate change implications for Mediterranean and Black Sea fisheries”. They are useful in ecological niche models and in the assessment of the effects of habitats shift due to climate change on fisheries. The presentation is available on the repository of the General Fisheries Commission for the Mediterranean Sea. Click here.